Embodying Roland’s world-leading digital technology, the Music Atelier organ inherits the full, rich sound and elegant design of a traditional organ combined with the most expressive and advanced home-organ features. For all who love the organ, we proudly present the magic of Music Atelier. 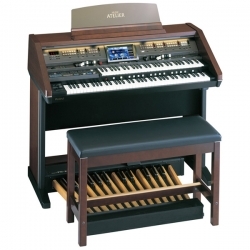 It’s gorgeous and stately, yet the AT-900C is portable enough be taken on the road. The contemporary, streamlined cabinet design combines a natural wood finish with eye-catching silver accents. Specially equipped XLR outputs facilitate professional setups for concert performances. Contents of this site Copyright � 2009, My Music Avenue. All Rights Reserved.